Photo of Faith Leaders singing "We Shall Not Be Moved" at the State Capitol by Dan Bacher. As Governor Jerry Brown was getting ready to portray himself as a "climate leader" at the upcoming United Nations Climate Summit in Paris, faith leaders, environmental advocates, frontline communities and residents from across California rallied at the State Capitol in Sacramento on November 12 to call on Brown to halt all dangerous oil and gas drilling practices, including fracking. They urged Brown to "remember his own religious studies, the moral imperative for planet stewardship, and need for climate justice when heading into global discussions around fossil fuel extraction," according to a news release from Californians Against Fracking. In the hope of pressuring Brown to ban fracking and other extreme oil drilling methods, 50 people attended a rally on the south steps of the State Capitol during which leaders in the Native American, Jewish, Christian, Buddhist and other faith traditions led a prayer and meditation. This partnership between faith leaders and environmentalists coincides with this year’s Global Frackdown to Paris, an annual international day of action to ban fracking and other unconventional oil and gas extraction techniques worldwide. The faith leaders pointed out the contradiction between Brown's claim to be a "climate leader" and his support of fracking and oil drilling in California. They said the Governor has "stood by as oil companies continue to employ dangerous drilling methods—like fracking, acidizing and cyclic steaming—despite mounting evidence of their harmful impacts to the environment and human health." Following the gathering, the groups delivered two letters—one signed by more than 150 faith leaders (http://static1.squarespace.com/static/54da947be4b0512a94d4a8a7/t/564bb66ae4b0c03db1586851/1447802505114/Faith+Leaders+Sign+on+Letter.pdf) - and another signed by more than 1,200 environmental and health groups over 30 countries—to the governor’s office. 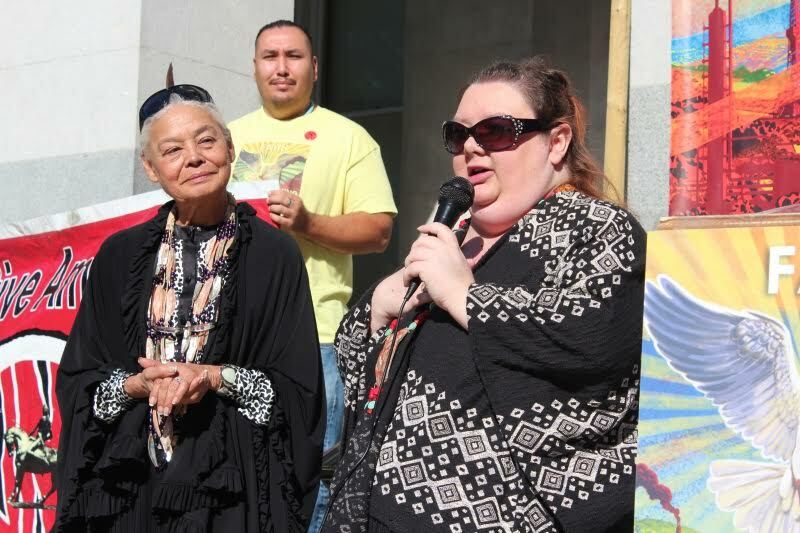 Ann Marie Sayers, Tribal Chairperson, Ohlone/Indian Canyon, and Director of the Costanoan Indian Research, Inc. opened the rally. 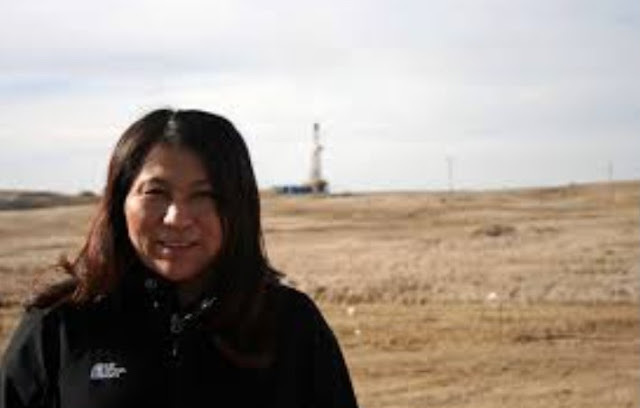 "Leave the oil in the ground - we don't have to squeeze every drop of oil out of Mother Earth," she said. "We need to ban fracking. Climate leaders don't frack. Governor Brown is supposed to represent us, not Big Oil." Kristen Debler, Coastal Miwok and a member of the Federated Indians of Graton Rancheria, said people must speak up for Mother Earth, pointing out the big threat to California's water resources that fracking represents. "We can't live without water," she said. "It is our soul and life blood - and we must protect our water." “As Governor Brown prepares for Paris, we are urging him to take bold action that will set an example for other world leaders," said Mark Schlosberg, a national organizer with Food & Water Watch. "But Governor Brown will not be a climate leader as long as he continues to promote fracking and increased extraction of oil and gas here in California, which has resulted in pollution of our water, crops, and communities. Rather than focusing on Paris, Governor Brown should focus on California, reign in the oil and gas industry, and ban fracking now." Food & Water Watch, a non-profit advocacy group, spearheaded the Global Frackdown to Paris letter: http://www.globalfrackdown.org/organizational-sign-on-letter. Sunflower Alliance decries system that mandates "sacrifice zones"
Other speakers at the event included: Brother Mark Schroeder, Franciscan Friar; Rabbi Nancy Wechsler, Congregation Beth Shalom in Carmichael; Ayya Santacitta Bhikkhuni, Co-Founder of Aloka Vihara; Jaemie Abad, Health Professional; Rev; Lupe Martinez, Assistant Executive Director of the Center on Race, Poverty and the Environment; and Jessica Wohlander, Rootskeeper and Faith Against Fracking. Groups represented at the rally include the California Water Impact Network (C-WIN), United Native Americans and other members of the Californians Against Fracking coalition. 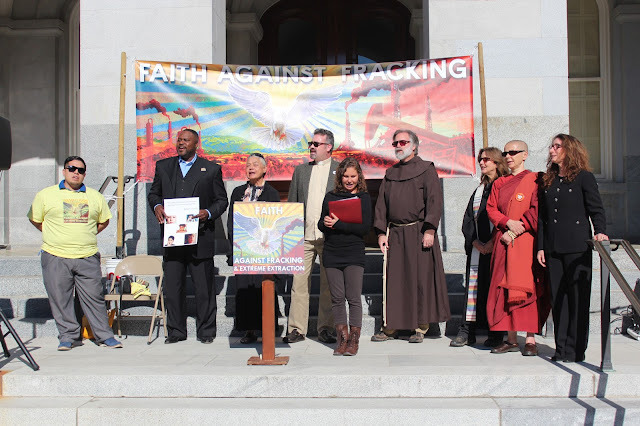 In September, Californians Against Fracking released a short documentary film in which faith leaders discuss the intersection of faith and environmental stewardship. Watch the full video at: http://bit.ly/1Op6cwK. Californians Against Fracking is a coalition of about 200 environmental business, health, agriculture, labor, political and environmental justice organizations working to win a statewide ban on extreme drilling including fracking. Follow @CAagainstFrack on Twitter. In breaking news, the Paris Prefecture of Police has announced that due to the tragic events that took place on November 13, when over 150 people were killed by guns and bomb blasts, the Global Climate March planned for November 29 and theDecember 12 mobilizations planned will not be allowed to proceed in Paris. Activists responded in a press release that "we are more determined than ever to make our voices heard on climate justice and throughout both weeks." The "Climate Leader" vs. "Big Oil Brown"
The mainstream media and much of the "alternative" media have provided mostly fawning coverage of Governor Jerry Brown's grandstanding at climate conferences and photo opportunities around the world as he continues to strongly support the expansion of fracking and other extreme oil extraction methods in California. However, the latest Big Oil scandals in the Brown administration have finally forced even the reluctant mainstream media to take a closer look at Brown's very close relationship with the oil industry and his avid support of the expansion of fracking in the state. Ironically, Brown made the controversial appointment on the same day that DOGGR, the state agency in charge of regulating the state’s oil and gas industry, released a critical internal review documenting the poor job it has been doing. The expansion of fracking in California – and the resulting pollution of groundwater supplies – is just one of the many environmentally devastating policies that the Brown administration has promoted, as I have pointed out in article after article. Governor Brown has relentlessly pushed the salmon-killing Delta Tunnels under the Bay Delta Conservation Plan(BDCP)/California Water Fix; has promoted water policies that have driven salmon, steelhead, Delta smelt and other fish to the edge of extinction; presided over record water exports out of the Delta in 2011; backs the clearcutting of forests in the Sierra Nevada; and is a strong supporter of neo-liberal carbon trading policies that routinely promote environmentally ineffective and socially unjust projects across the globe. 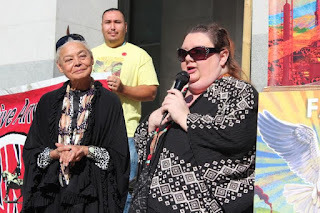 Ann Marie Sayers, Tribal Chairperson, Ohlone/Indian Canyon (L), and Kristen Debler, Coastal Miwok and a member of the Federated Indians of Graton Rancheria, urged Governor Jerry Brown to ban fracking now. Photo by Dan Bacher.